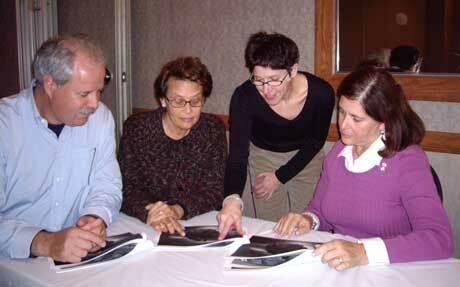 Richard Michaelson, Allyn Michaelson, instructor Bette Birnbaum, and Roz Melzer examine an ancient Israelite coin in a 2007 Melton class. Clearly, that view is shared by others. When the two-year adult education program was scaled back this past year because of cuts in funding, a group of graduates banded together to launch what has proved to be a successful rescue effort. The Melton loyalists – spurred by Sharon Weiss, a member of Wyckoff’s Temple Beth Rishon – created a network of synagogue liaisons to reach out to their respective shuls, seeking financial support for the program. Thanks to their efforts, a consortium of some 20 synagogues and two JCCs has joined with UJA-NNJ to fund the program for the foreseeable future. Armed with a list of graduates, together with information about their synagogues, the group conceived the idea of a consortium, asking Melton graduates to arrange meetings between synagogue leaders and those pitching the consortium plan. Weiss said the consortium is still a work in progress and she expects that more synagogues will “come aboard.” She said she is not worried about attracting students, since there is already a waiting list. “I have a responsibility,” she said. “I never understood that. I’ve found my Jewish voice,” she added, noting that not only did Melton inspire her to visit Israel but it empowered her to take leadership positions within her synagogue. Calling UJA-NNJ the “anchor” of the program – which she expects to attract between 100 and 200 students – she pointed out that federation is providing staffing for the program as well as serving a fiduciary role. “The details are still evolving,” she said, adding that the fall program will include one Melton 2 class as well as post-Melton graduate classes. The program will be open to the community. For additional information, visit www.ujannj.org/meltonschool, call (201) 820-3914, or e-mail melton@ujannj.org.